Chhatisgarh, is a state in Central India,which is 10th largest state of India.Its believed that Chhattisgarh got its name from the 36 pillars of Chhatishgarhin Devi Temple, chhattis means 36 and garh means fort.The state of Chhattisgarh is known as the rice bowl of Central India. Most of the traditional and tribal foods are prepared with rice and rice flour. You know wat, one of the common meal Chhattisgarh people enjoy during scroching summer is Bore Baasi which is one of ancient food which we would have tasted atleast once in our life. Yes this Bore Baasi is nothing a day old cooked rice served with rice soaked water or buttermilk or else with curd and it is served along with pickle or shallots. Chhattisgarh have its own tribal cuisine,coming to this Khurmi, its one of the traditional sweets prepared in this state. Along with khurmi, balooshahi,kusli and gulgula are well known sweets of Chhattisgarh. While googling i got this healthy but deep fried Khurmi recipe from here, this sweet is very easy to prepare but very addictive. Wheatflour,jaggery, ghee and sesame seeds are the main ingredients for making this sweet, once deepfried you can conserve this sweet very well.They can lasts for many days. Take the ghee,flour,sesame seeds, grated jaggery in a bowl. Prepare a tight dough(if needed sprinkle some water). Make thick flat oval shaped balls from the dough. 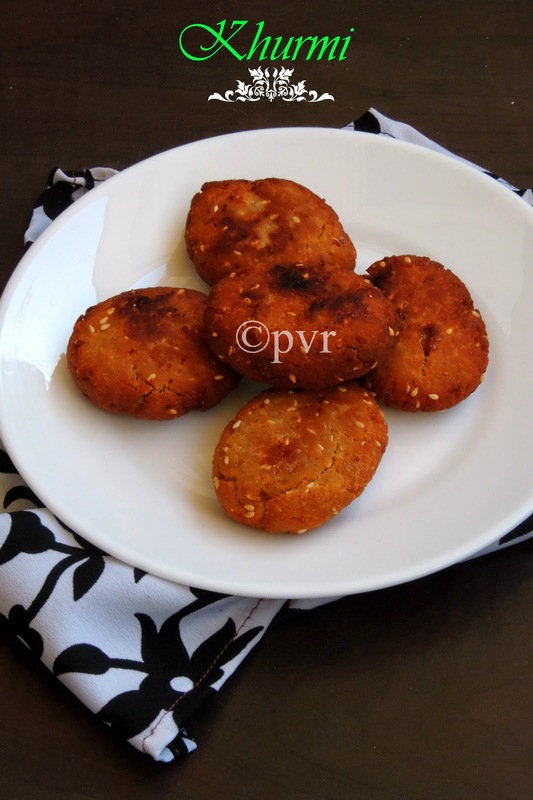 Deep fry the khurmi in small batches until they turns golden brown. Khurmi indeed looks very very delicious aks :) wonderful choice for chattisgardh ... Can i grab one from the screen wish I could , they looks too tempting !! That sure is an excellent sweet..which is tempting me. This is more like our Athirasams Priya?..very nicely made..
this is so much like thekua. love the recipe and so want to grab it from the screen. Same pinch Priya, I too prepared this and it tasted great..Your Khurmi looks great..
Khurmi looks inviting and must be delicious too ! Nice click Priya ! very appealing photo . bore bassi is looks like out pazhathu isn't it ? Easy to make dessert. It must be tasty. Traditional recipes are simple and tastes divine. Never had this before, but I am game for anything sweet. Looks good ! They must be very delicious. Very tempting and easy to make dessert. Very interesting recipe, very new to me. The khurmi turned out great. Same pinch Priya. I agree that these are super addictive! This looks a lotlie thekua minus the sesame seeds. Looks delicious . Looks so delicious. New to me. Is the background for the blog new? Looks good. Never heard of it, sounds like an interesting & delicious recipe. wow these are so tasty and so simple!! looks very tempting!! Such an easy to make recipe!!! Love those sesame seeds peeping on that dark brown sweet. Looks tempting. I am going to try these and have a question. Do they turn softer because of the wheat flour if we store longer? Temting khurmi's priya.. Perfect for snacking.. This is such a nice sweet Priya!